Netanyahu promises to promote resilience program for the Israeli communities in southern Israel. 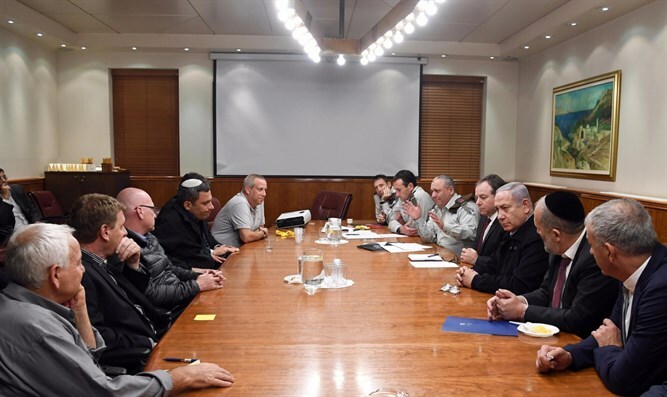 Prime Minister Binyamin Netanyahu, Finance Minister Moshe Kahlon, Interior Minister Aryeh Deri, IDF Chief of Staff Lt.-Gen. Gadi Eizenkot and IDF Southern Command Chief Herzi Halevi met on Thursday evening with heads of local authorities from the Gaza envelope at the Prime Minister's Office in Jerusalem. The meeting was attended by the Head of the Sdot Negev Regional Council Tamir Idan, Sderot Mayor Alon Davidi, Head of the Eshkol Regional Council Gadi Yarkoni, Head of the Merchavim Regional Council Shai Hajaj, Head of Hof Ashkelon Council Yair Farjun, and his successor Ofir Liebstein. During the discussion, the prime minister, the chief of staff and the head of the Southern Command presented the military efforts being made against terror from Gaza. In addition, the discussion focused on the promotion of a resilience program for the Israeli communities located near the Gaza Strip for the years 2019-2020, amounting to 500 million shekels. The program, which will be submitted to the government for approval in the coming weeks, will include strengthening emergency medicine, informal education, welfare services and will provide security grants to the authorities to assist in their ongoing functioning. In addition, the program will provide additional quotas for farmers in the region, subsidies for day care centers, and more.